Quilty people are the best people, aren't they? Every time I get to go to something like Quilt Market or Stash Bash or what-have-you, I'm reminded of this. Everyone was so kind and welcoming! I got to place lots of names with faces and I got to see lots of great people I'm lucky to call friends in Portland. 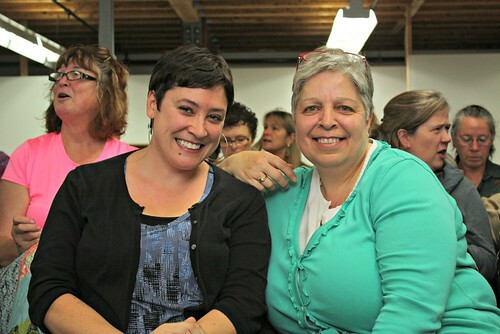 On Friday, I got to sit in on the Portland Modern Quilt Guild's regular meeting, which had a presentation on the new MQG membership model by Alissa Haight Carlton as well as an amazing trunk show by Jacquie Gering. I adore Jacquie, and being the tall girl I am, she asked me to help Jen hold her quilts, which was so amazing. Being up close and personal with those quilts was just incredible. And hearing Jacquie speak about her quilts, gosh... I'm not sure I can put into words how hearing her speak and share her passion made me feel. Suffice it to say, it was something I won't forget for quite some time. And I can't forget to mention Jamie...she lives in the Portland area and was kind enough to drive some of us about here and there. Her sense of direction caused quite a bit of laughter, the kind of laughter that nearly brings you to tears. I will never look at a bike lane quite the same way again, Jamie!! Thanks for the rides! 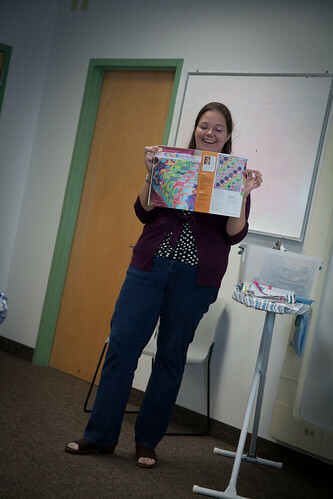 It was such a kick picking up my nametag and attaching a sneak peek of my book cover to it! It was positively surreal to talk to people and have them ask about my book. It made me kind of swallow my fear of talking about myself, and I had some great conversations with people as a result of that beautiful little conversation starter. Speaking of my inability to talk about myself, there's something kind of big I've been up to that I haven't really shared here on my blog yet. Since the end of January, I've been on a bit of journey. A journey to become a healthier, fitter me. I've never been a thin person, other than when I was a young child. I've always been heavier, in part due to my love of baking and also because I've always despised exercising. But something happened to me in January. I decided I wanted to make a change. I didn't like what I saw in the mirror and the way that I felt. I've half-heartedly dieted over the years, but there's something different about this change I've been making. It's not a diet. It's a lifestyle change, as cheesy as it sounds. I'm not just changing the way I eat for now, I'm doing it forever. And it feels good. I started doing Weight Watchers first, and after seeing some good results in the first eight weeks, I added in some exercise, starting with the 30 Day Shred. I spent 29 days doing the 30 Day Shred , and now I'm doing the Hip Hop Abs video series, and having a shocking amount of fun with it. It doesn't feel like work when I constantly see the scale moving and feel my body changing. I'm usually a pretty private person, but sharing my successes and seeing the success and accountability of others on IG using the #sweatnsew hashtag is really inspiring and keeps me going. I'm talking about you, Terri and Becky! My journey is not yet over, but I'm halfway to my goal, which is a great feeling. This whole change in me made going to Market a really interesting experience - lots of people noticed that I looked different, which was both flattering and mildly mortifying at the same time. Sometimes I even have a hard time seeing a change in myself, so I thought I'd dig up some pictures from last Market to compare to pictures from this Market. 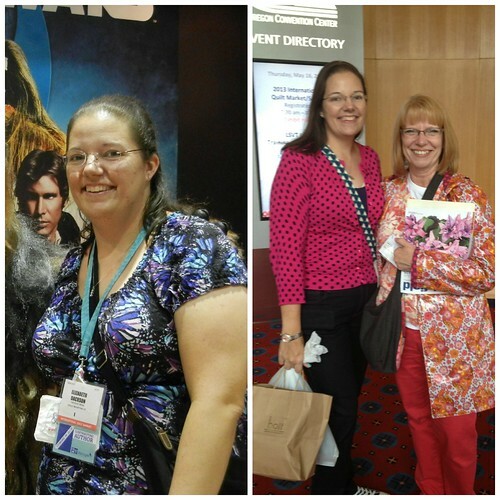 Left side is last year, 40 pounds heavier, and right side is this year, with the lovely Cindy of Live a Colorful Life. Don't you love her gorgeous Little Folks raincoat?!?! So, this is my last Spring Market post for this year. Next week, I'm planning to get back into my sewing room and start making a dent in my ridiculous wip list, starting with end-of-the-year teacher gifts! Are you making teacher gifts this year? What are you making? I'm still undecided, and running out of time! Have a wonderful Memorial Day weekend! Have you seen the new linky party, Sew Thinky Thursday? My friend Emily, of Mommy's Nap Time, has started a new linky party that encourages thought and reflection on your sewing journey, and this is her first week, so I wanted to make sure to participate to support her on this fun new creation. I like to think and reflect, and I don't do it nearly as often as I'd like, so here goes. This week's question: When did you start sewing? Tell us a bit about your sewing history. When did you realize you were hooked? My first attempts at sewing were in my early girlhood, and I failed miserably. My mother wasn't much of a sewist, but my aunt was. She was a quilter, and lived very far away, so I didn't really have an adult to teach me. I had doll clothes and quilts that my aunt had made me (like the one in the picture) to admire and I tried to teach myself from books at the library. I think these early failures have something to do with my healing distaste for hand-sewing, as these were hand-sewing attempts. The good news is I have almost gotten over my allergy of hand-sewing, at this point. As I approached my teen years, I learned to cross-stitch, and enjoyed that for a while, until I decided it was dorky and boring, so I quit doing that and spent my energy being a moody, journaling teenager instead. After my son was born and I became a stay-at-home mom, I needed an outlet. I needed something to do, something to feel proud about, something to exercise my creativity. All of my adult life, I'd been a workaholic, the kind of person who was proud of their work and got a lot of enjoyment from it, so I felt like I needed something that could take the place of that hole in my life, though I enjoyed being a stay-at-home mom a great deal. I was wandering around Jo-Ann's one day, looking for something to do, and I stumbled into the sewing machine center, and wound up walking out with a sewing machine, a rotary cutting mat, a rotary cutter and so forth. I checked out books from the library, and tried a handful of projects from those books, from a notebook cover to receiving blankets and a Cat in the Hat hat, and it wasn't until I made my first quilt that I really felt hooked. I felt like it was something that was fun for me to do, that took thought and effort, that made me feel like I was something more than just a mom. In short, it was awesome. After that first quilt, from which I learned all kinds of things to NOT do when quilting, I trucked right on, starting another quilt, learning more from it, and then another, and another, and eventually starting my blog, and to this day, there isn't a day that goes by without my thinking about sewing or doing actual sewing. It's a part of my life now that I can't imagine my life without. When I meet people, I identify myself as a mom and a quilter. It's a huge part of my identity. Sewing really changed my life for the better. It's led me to being more social than I've been in years, brought a kind of joy that was lacking in my life, and has afforded me opportunities I couldn't possibly have dreamed of when I first started. Want to join in the thinking and sharing fun? Link up your post with Mommy's Nap Time every Thursday. 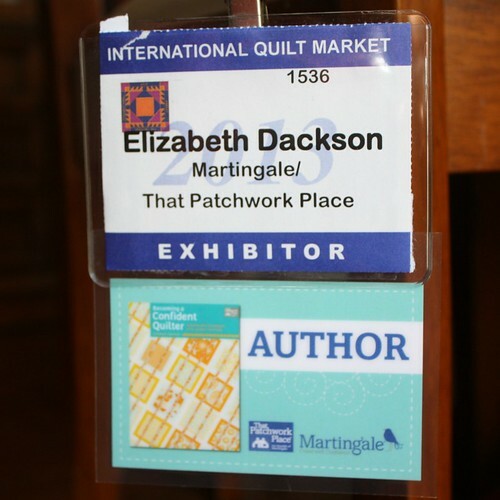 I'm looking forward to linking up and learning more about other blogging quilters. Happy Thursday - and stay tuned for a new tutorial tomorrow! I was pleasantly surprised this morning when I checked my email after our family egg hunt and found a little note from Cindy of Hyacinth Quilt Designs. Do you know Cindy? You should :) She's the wonderful quilter behind the wildly popular Garden Fence block tutorial, and she is such a sweet person. 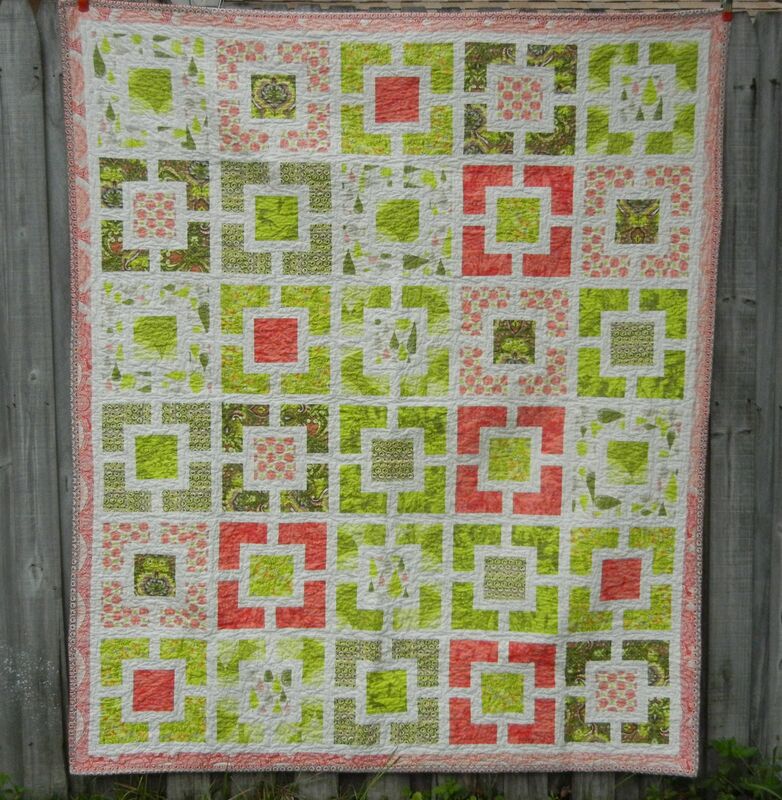 I made a Garden Fence quilt, using Cindy's tutorial, last year using Tula Pink's gorgeous Prince Charming fabrics. 1. If you're not quilting, what are you most likely doing? 2. Do you buy fabric with a specific project in mind or "just because"? 3. How many quilting projects do you have going at once? I'm usually a multitasker, flitting between several ongoing projects, but lately, I've been trying to tame that habit a little bit. In the past, I'd try to juggle as many as ten different projects, but I'm trying to prioritize my time better, rather than spending 30 minutes trying to decide which project to work on. Sometimes I really wish I were the kind of quilter who could work on just one project at a time - maybe I'd be less messy that way! 4. How many completed quilts do you own? Um...I had to go count them :) I've given many of the quilts I've made as gifts and also some to charity, but I currently own 11 of my quilts, including 3 that belong to my son. 5. How do you use your quilts, or are they stored away somewhere? I rarely feel cold. I mean, I live in Florida, and even in the winter, it's never really all that cold here. I tend to keep our air conditioning cooler at night, as I like to snuggle under my big warm/cool quilt on my bed at night, and my husband is always griping that it's cold, so he often will snuggle under a quilt on the couch. When my mother visits, she sleeps under a few quilts. I definitely put my quilts to use. They also make great forts! My all-time favorite food in the world is my mother's fried chicken with biscuits and gravy. So down-home and tasty, it's the kind of meal that just says "home" to me. Such a tough one!! Um...I'd have to say teal, gold, and aqua. It's funny, before I started quilting, I was a bit of a color snob. There were colors I would often say I just didn't like, but now, it's almost as though I appreciate color more than I used to. There really isn't a single color I think I would say that I don't like, but if you looked at my fabric collection, it would be super easy to see what color I like best, and that's blue. 8. Where do you get your ideas and/or inspiration? Holy cow, I cannot believe it is officially my first blogiversary today. It doesn't feel like an entire year has passed since I created this little blog, but the day has indeed come. I actually almost forgot - I happened to click the "oldest" button on the Edit Posts page in Blogger, and saw the date of my first post, and just about fell off my chair. Really? Has it been a year??? And what's an anniversary without a present??? To thank you all for being a part of my blog over this last year, I've got a lovely Cosmo Cricket Circa 1934 layer cake up for grabs, thanks to the lovely Brenda at Pink Castle Fabrics who is generously celebrating with me today. Isn't it adorable? I love Cosmo Cricket, and Circa 1934 is a super unique new line for Moda. Personally, I'm a big fan of the reds in this collection, and the black prints are super fun, too. To enter, simply leave me a comment, tell me what you'd like to see on my blog over the next year. Another quilt-along? More patterns? More process posts? Talk to me! :) I will draw a winner with Mr. Random's help on Monday night, 9/26/11, at 11:59 p.m. EST. Good luck and have an awesome weekend!